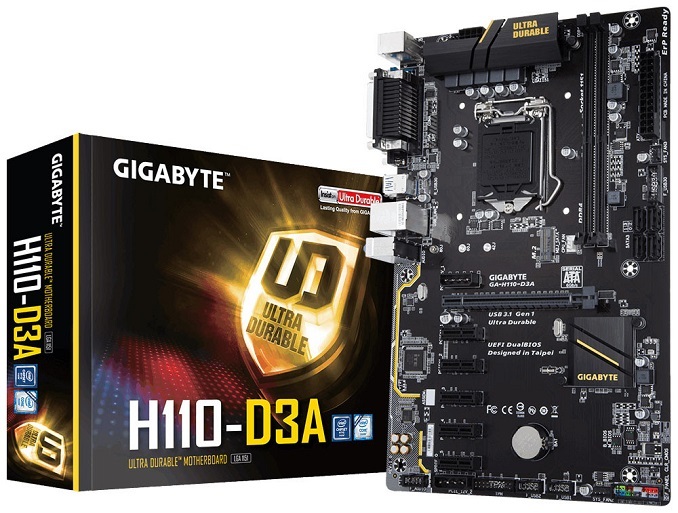 GIGABYTE this week has taken the wraps off of a new motherboard built specifically for the again popular cryptocurrency mining crowd: the H110-D3A. Like other boards targeted at mining, there are a plethora of PCIe x1 slots. Having several PCIe x1 slots on mining motherboards make it more cost effective to simply add more video cards into a single system, rather than expanding to additional systems. Despite this being a mining focused board, some more common features found in mainstream consumers boards are here, such as a Realtek ALC887 audio codec, although others are left out as well in an effort to reduce board prices for this cost-conscious and investment-oriented market. Based on Intel's H110 chipset, the H110-D3A has five PCIe x1 slots from the PCH and a PCIe x16 slot from the CPU, giving a total of six slots for GPU mining. 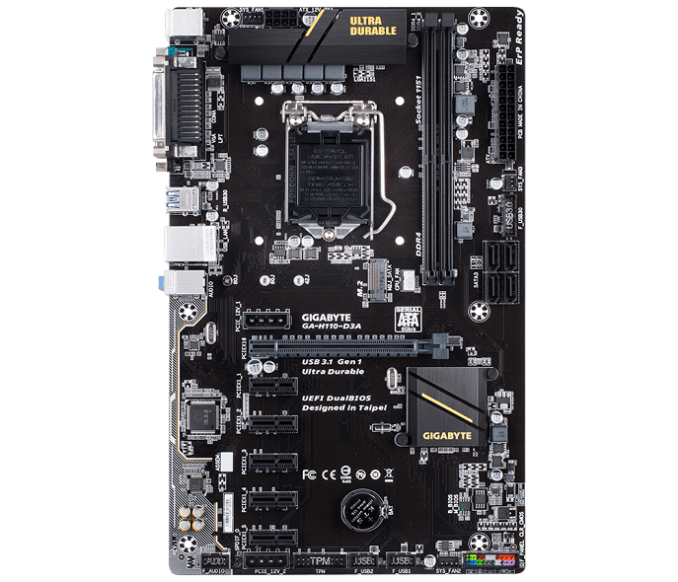 This is compared to a typical consumer motherboard board with three or four PCIe slots, so it is easy to see the value proposition for miners. Due to the socket/chipset combination, processor support is for both 6th and 7th generation Intel CPUs, while memory support is listed at DDR4-2133/2400 and 32GB for the two DIMM slots. It is pretty sparse on extra features, as are most boards aimed at mining, but it still offers a full PCIe 3.0 x4 M.2 slot and four SATA 6 Gbps ports. 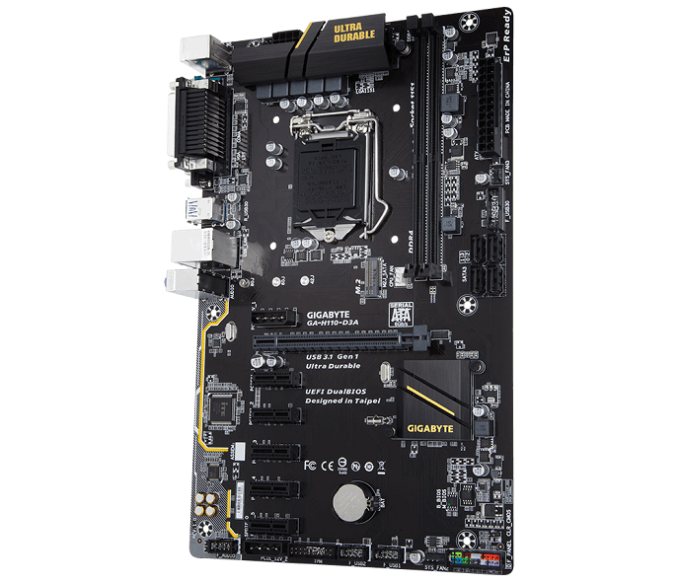 The board is built using GIGABYTE's “Ultra Durable” components, which GIGABYTE states are tested for extended operation. Power is fed to the board and CPU via the usual 24-Pin ATX and 8-Pin EPS sockets, which in turn is regulated by a 5-phase VRM setup. Two additional power headers, via 4-Pin Molex plugs, are located above the first PCIe (x16) slot and below the last (x1) slot to handle the additional power required for running several video cards through the multiple PCIe slots. Connectivity on the rear panel is basic, but all the required elements are there. This consists of two PS/2 ports, one parallel port, one serial port, a VGA port, two USB 3.0 ports, two USB2 ports, a Realtek Gbe LAN RJ-45 port, and Realtek ALC887 based audio. Pricing is currently $89 at Newegg.com, though the board is not in stock at the time of writing. Compared to the Biostar TB250-BTC (see in the links below). the cost is a few dollars less with a similar number of PCIe slots available for mining duties. The competition seems to be heating up around the sub $100 segment for mining boards as more boards hit the market and board partners attempt to cash in on the mining craze. Well, memory prices were bad even before the mining craze started. That's partially due to instability and insufficiency in supply in the DRAM market for a while now, and Toshiba's attempt at selling off their memory business isn't helping either. The GPUs are totally miners' fault though. Something I do not get: if the ports are not open-ended, how do you plug in a x16 card?